I have a tiny mortar and pestle. That’s not a euphemism. I mean the kitchen implement, and the one I have is a great size for say, crushing herbs or making almond dust. (Internet commenters, I have provided you with some excellent straight-lines here, I expect top-notch work!) But it’s too small to crack enough peppercorns for steak au poivre for six people. Sterner measures were called for. So there were my peppercorns, crushed with the best tool I had for the job – a warhammer. Hey, it’s not just my weapon-of-choice for the zombie apocalypse, it’s also a handy tenderizer and whatnot! I’m pretty handy with a steak, if truth be told. Knowing how to nicely pan-roast a good cut of meat was one of the skills I came into this project having if not mastered, at least journeymaned. But I was looking forward to this dinner – I found some really beautiful filets mignon at the local Costco. They were really thick, and a deep, dark red color. Like theater curtains. Of meat. Like you, I don’t think filet deserves the reputation it gets, it’s kind of bland. But it certainly has a buttery, toothsome texture, so kicking up its flavor with some pepper for spice, butter, cognac and to add some fat and flavor? Yeah, I’m in. And the prospect that the pan would flame up made it even more enticing! I had two pans large enough to use, and six steaks to do. Because everyone was sitting down together, I couldn’t do them in batches, per se, they all had to finish resting at the same time. So I got both pans ripping hot. Not as hot as I normally would, because your instructions call for a a little less heat, presumably because of the butter rather than oil – lower smoke point and all. I seared ’em up nice and brown, then transferred all six into the cast-iron pan in the pre-heated oven. It was then that it was time to make the flame happen! Action Shot! Only...without the action! No flame. I was excited about this, too – giant gouts of flame are ALWAYS fun, and when they’re combined with delicious meat and booze? That’s a fiesta, Chef. A goddamn fiesta! But there was no flame here, just the steam and smoke. I realized why, after the fact – because this pan hadn’t roasted in the oven (the other one was doing that) it wasn’t as hot as it otherwise might have been. 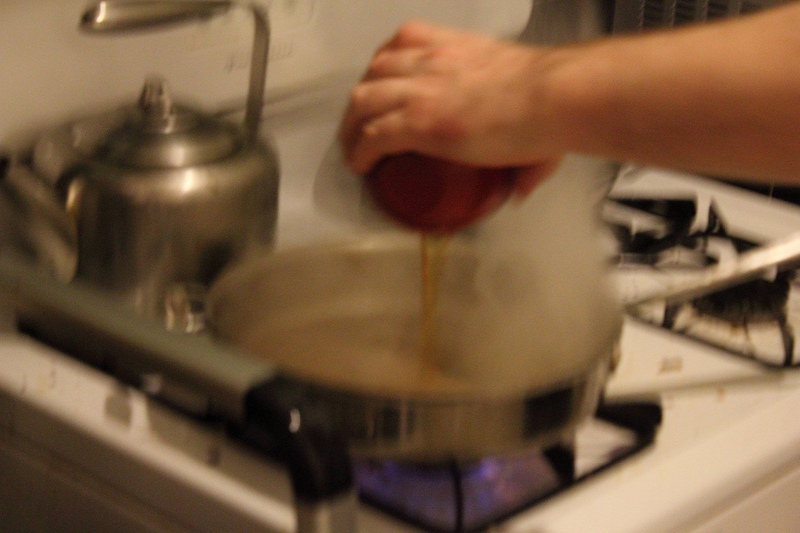 So, the cognac didn’t flare up, but the resulting sauce was still pretty amazing. Hard to go wrong with butter, fat, cognac and seasoning though, right? I de-glazed the second pan with the sauce when it came out of the oven too, not wanting to waste any of that delicious frond. 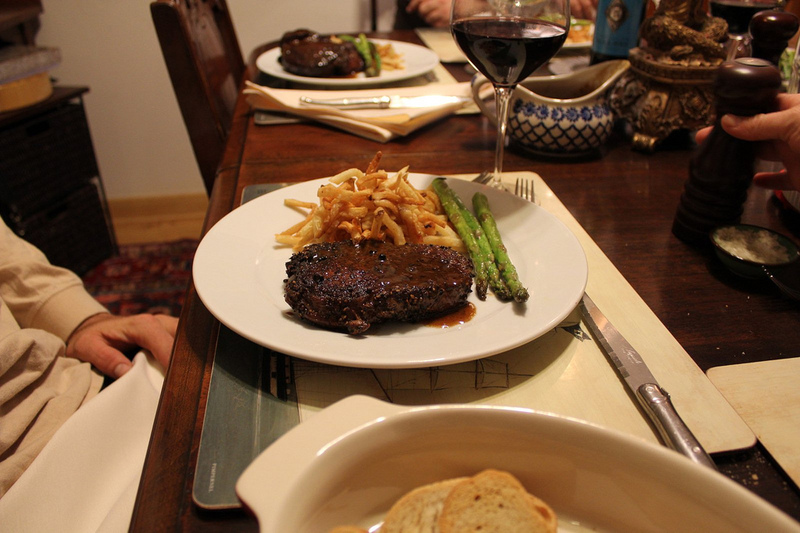 I served up the resulting symphony of beast, flame, booze and warhammer-crushings with truffled pommes frites, sauteed asparagus, and love. That’s the secret ingredient. HAHA. No, just kidding, the secret ingredient is definitely the booze. Have some booze for me, Chef. P.S. The leftovers the next day might have actually been even better, chef!